Chilled uncooked filo pastry in ready to use sheets. 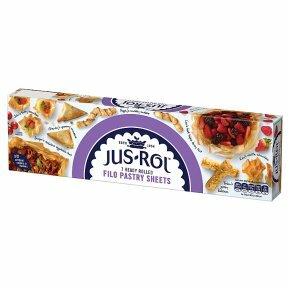 Perfect for savoury dishes or desserts needing a crispy pastry. No artificial colours or flavours. Suitable for vegetarians and vegans. John's tarty tomatoes, Mandy's yummy samosas, Jacqui's delicious vegetable tart, Kay's nicotta crunchies, Poppy's sneaky snakes, Lee's best triple berry tart, Lee's best triple berry tart, Brian's gooey Baklava, Kay's nicotta crunchies. Filo Pastry Tips Let your Pastry Temper to a Room Temperature For best results, take the pastry out of the fridge approximately 20 minutes before you are ready to use it, as it will be easier to work with. Do Not Overfill Don't be tempted to overfill your filo parcels as they could leak during cooking, which might prevent your pastry from crisping up. If You Have Some Filo Pastry Sheets Left Leftover filo pastry can be wrapped in cling film and frozen for up to a month. Defrost completely before using. 1. Take out of the fridge and remove from the carton approximately 20 minutes before use. After this time, for best results use immediately. 2. Remove from plastic wrap and unroll the pastry sheet. 3. Bake in a preheated oven at 200° C (180° C for fan assisted ovens)/ Gas Mark 6, or at the temperature required in your recipe.